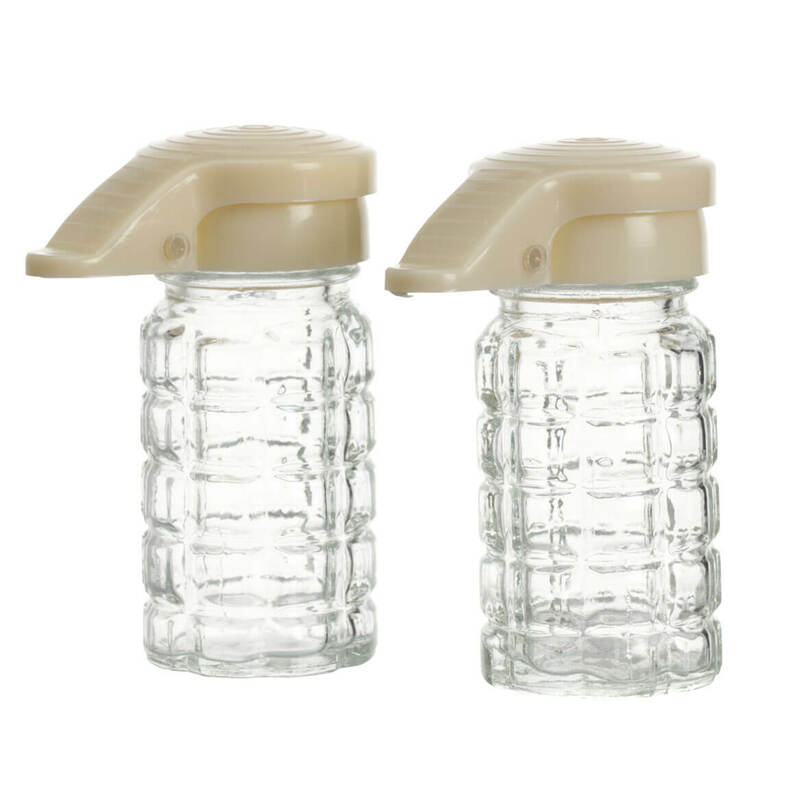 These are great for travel and picnics, no spill lids. Makes my day easier and spill free. perfect for camping.......no spilling, no moisture! Great buy, best salt and pepper shaker, I've ever bought. I like their size, and that they are moisture proof. I really, love them !! The way the lids fit nice and tight, and goes closed when I let go of the handle... plus they look nice on my table !! I bought 2 sets for my husband and me for our lunch boxes. Works great, they stay closed. I would definetly buy them again and give them as gifts. I use them to keep my salt dry. It is very humid where I live in an area has been very humid this year. I was tiered of having to through out my salt be it had lost it's saver. With lids they keep the salt dry. I was excited to find these in the catalog. We used them when I was a child. They are a necessity in Louisiana's damp climate... if not closed tightly, salt clumps. I used them exactly 6 days when the spring broke on the first one. The second lasted a couple more days. Money wasted. Never again. They were JUNK!!! Perfect for the humidity at our cottage on the lake. I would rather not fill them with rice or have to unplug the holes with a toothpick. to put beside my stove. This way nothing get in. Loved the look and the tops. They remind me of my youth! They are great for camping!!! Our dining hall has a moisture problem with their salt shakers. Need for camping, I've looked everywhere for a set like these. Moving to the tropics and can't keep salt dry. Love these. Just the right size and I love that they are covered. They are humidity resistant and work very well here in the state of Florida. We entertain outside a lot and covered shakers will work well out on the patio. In New Orleans humid climate, these are a necessity and very hard to find. these look awesome! for outdoor use. am going to give them as gifts too. We have a camper where moisture is a big problem. Salt/pepper in regular shakers turns into concrete. Have been looking for some that have a lid that seals. Hoping these will work. Keep moisture out and stay fresh longer. Glass. I have had them before and needed more. I have had some like this for years, need replacements, and have been unable to find any in the stores. Good idea for camping and any where there is moisture. To use when I go camping and the moisture doesn't get in my salt and pepper. Used to have these and loved them. Replacing the ones I had. To keep fruit flies out of my salt shaker. Are there pegs on the inside of the cover that seal each hole while closed? 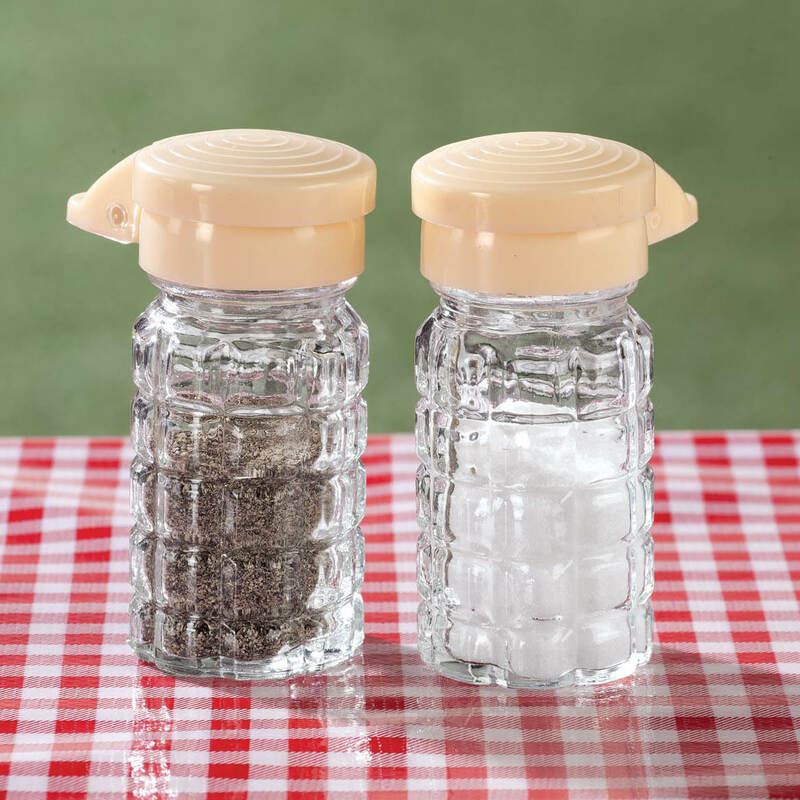 I don't want there to be salt & pepper in the cover that will spill out when it gets opened. The holes are raised so that when you close the top it touches the top and seals it pretty good. hope this helps. There is a soft pad inside the cover. I had my last ones for ten years. It was time to get new ones.